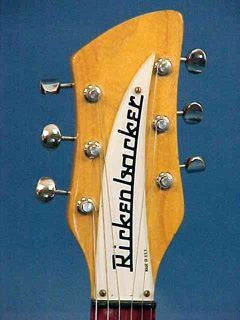 Introduced in 1958 the model 325 became one of Rickenbacker´s most popular models. Originally equipped with two control knobs in 1958. Two additional knobs were added during 1959. 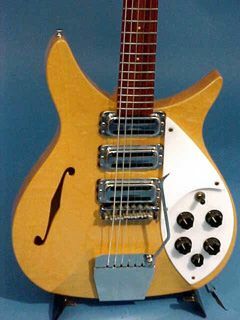 The model is a short scale 3/4 size guitar, that found its way to popularity through John Lennon. John bought his guitar in Hamburg 1960 and is probably the Rickenbacker guitar that is most associated with a single artist. 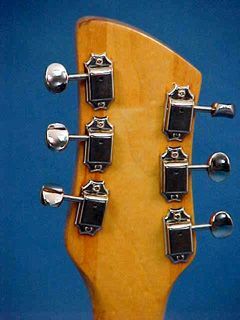 In the beginning this guitar had a Kauffman Vibrola tailpiece that was later replaced with a Ac´cent Vibrato tailpiece. 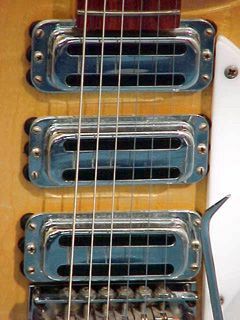 John replaced the Kauffman on his '58 Rickenbacker with a Bigsby vibrato tailpiece. There are several models available of the 325. Two reissue models associated with John Lennon, the 325V59 and the 325V63. Also a limited edition model 325JL. The model 325 is available with an F-soundhole or with a solid top. 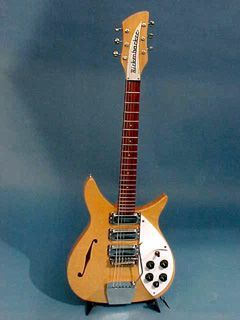 Lennon´s two guitars had that option (solid top). The export version of the model 325 was called 1996. 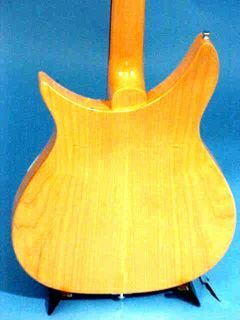 All export models had an F-soundhole.